Are you tired of smearing your phone or tablet screen with finger grease every time you tap on it? Do you usually have a ballpoint pen on you? If so, why not combine something you already always carry with something you’ll also enjoy using? Take a look at the Just Mobile AluPen Twist L or S; the ballpoint pen stylus. Packaging is simple, with an informative how-to change the refill printed on the inner sleeve. 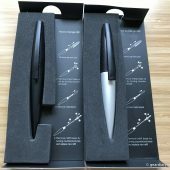 Let’s take a look at the two different stylus pens. Measuring 5″ long by 0.7″ wide at its middle, this little fatty is available in black in silver; the bottom silver portion is aluminum, and the top black portion with the built-in pocket clip is composed of ABS plastic. 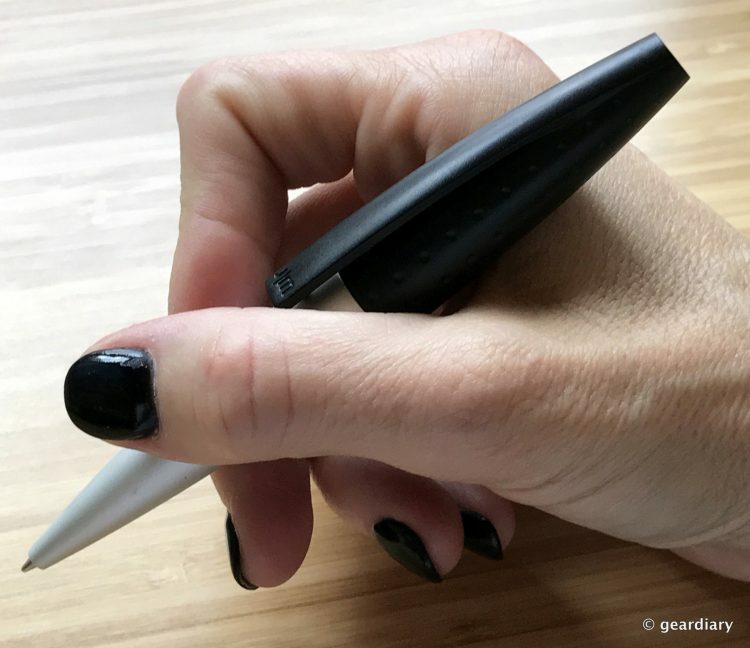 When you twist the pen counterclockwise, you expose the soft stylus built into the pen’s cap. When you twist the pen clockwise, you expose the ballpoint pen. It’s a medium black ink that is a pleasure to write with. That brings us to the slimmer AluPen Twist S. Measuring 5″ long by 0.53″ thick, the S is available in black on black, gray and silver, orange and silver, and white and silver. Once again, the bottom black portion is aluminum, and the top black portion with the built-in pocket clip is composed of ABS plastic. As with the L, turning the top portion of the pen counterclockwise will expose the soft nib. Twisting the pen clockwise will reveal the same smooth-writing black ballpoint pen. 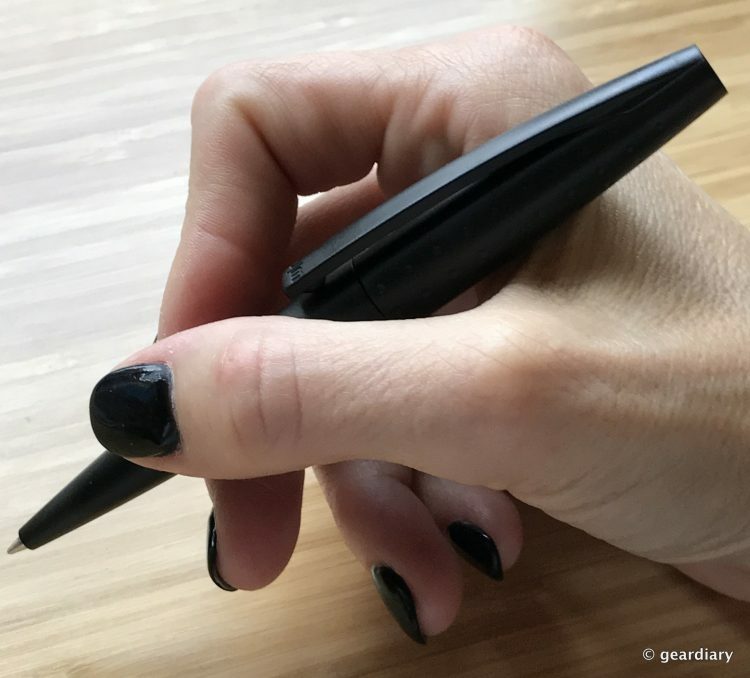 When it’s time to replace the ballpoint pen, you’ll just need to purchase a similarly sized stylus pen refill (they have them at just about every office supply store, or you can find packs of 5 here). If you manage to lose or destroy the rubber nib, you can order set of 3 replacements (in several colors). I really like how neither the stylus nib or the ballpoint pen are exposed until you need them, and while the $30 retail price is a bit high, you can find it for a bit less on Amazon. 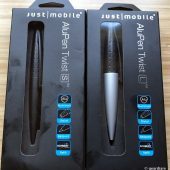 My favorite is the Just Mobile AluPen Twist S, because it fits my hand better, but if you have a larger hand or just like a fatter pen, you’ll enjoy using the L.
The Just Mobile AluPen L and AluPen S retail for $29.95 each, and they are available directly from the manufacturer or from Amazon [affiliate link].